Seismic Retrofit Contractors and Engineers. Common repairs for defective retrofits. Important research reports on retrofit-relevant topics. Structural damage experience in previous earthquakes. Seismic retrofit contractors sometimes find it necessary to repair an existing shear wall or use methods that are not found directly in any building code. Much useful information is found in the American Plywood Association (APA) publications as well as in tests and publications by other agencies as well as damage reports made earthquakes. This webpage is an introduction to retrofit techniques using these less readily-available sources. In order to better understand these more advanced applications of seismic retrofit principles, make sure you are conversant with the material in this general introduction before proceeding any further. 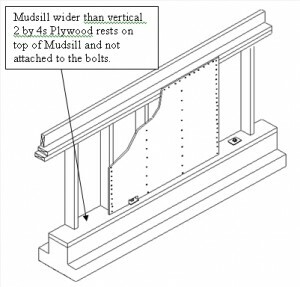 A very serious error in retrofit shear wall construction involves failing to connect the plywood to the bolted mudsill. The reason this can be such a problem, and a discussion of the four different ways it is addressed, can be found on this webpage: Connecting the Plywood to the Mudsill. 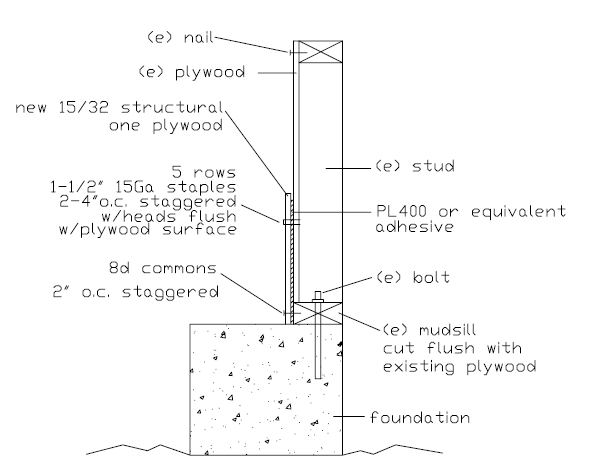 This drawing shows plywood that is on top of the mudsill rather than being nailed or stapled to it. This can occur because mudsills are almost always wider that the 2 by 4 studs. If it is not connected to the bolted mudsill, then the earthquake forces will not be transferred into the bolts and the retrofit will fail. Below is a construction detail illustrating the same process. Most contractors simply tear out the existing plywood and start over, not knowing a simple repair is possible. In this test plywood was stapled to plywood to see if how strong this connect would be. This is useful when it is necessary to attach to pieces of plywood together which is often the case when the contractor did not attach the first layer of plywood to the mudsill. The next consideration is uplift or overturning forces. High capacity shear walls must resist a tremendous about of overturning. For example, a high capacity shear wall can create 14,400 pounds of force trying to lift the ends of the shear wall up off of the foundation. For this reason proper sizing of hold downs is critical. Additional Seismic Retrofit Information for Professionals. Only use borate pressure treated wood that has none of the corrosive qualities of very corrosive ACQ pressure treated lumber. Technical Note 370C provides a very handy shear wall repair technique that can be used when the original shear wall builder neglected to put blocking between the horizontal plywood seams. 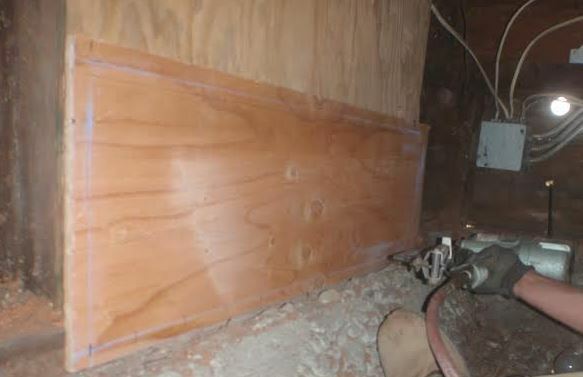 Technical Topic TT-012 discusses how to deal with shear walls where the installer shot the nails through the plywood. This often happens when the installer uses a framing nail gun rather than one adapted for shear walls. This page describes why joining of top plates is so important. This article about Research Report 154 discusses alternative methods and things to watch out for when building shear walls, and discusses stapling, double sided shear walls, lack of blocking, installations over sheet rock, nail penetration, thickness and grade of plywood, and the effect of stud spacing. This article about APA Research Report 138 discusses the construction and testing of ultra-high capacity shear walls. These shear walls use large sized framing multiple rows of nails and staples. Technical Topic TT-076 discusses the best way to frame high capacity shear walls using 2 by 4 lumber rather than the 3 by lumber required by the International Building Code. Technical Topic 0-58 describes the effect at nailing at a slant. The Mudsill Connection is extremely important as it analyzed one of the most important connections in retrofit shear wall construction. The actual earthquake resistance of drywall. Because of plywood tearing in Northridge, the City of Los Angeles downgraded 3-ply plywood to a maximum of #200 plf. On page 10 of the Wood-Frame Subcommittee Findings Report published immediately after the Northridge Earthquake it says: “The performance of 3-ply construction has raised questions of its ultimate capacity. Horizontal tearing has occurred on some outer face plies above the inner ply seam. Values for all 3-ply panel construction were therefore reduced to 200lbs/ft maximum.” Los Angeles uses this rating for 3-ply plywood shear wall material in its building code, while the 2013 California Building Code does not. If a house has already been retrofitted with 3-ply plywood, you may want to consider replacing it or nail the proper plywood on top of it. Retrofit hardware is also an important part of shear wall construction as well as the retrofit of homes without cripple walls. It is important that one be able to read the catalogs produced by the tests done by KC Metals and the Simpson Strong-Tie company. Building Codes and other testing. A history of building code changes is also important. The provisions in the code in effect at the time the house was built tells us what is already there. The lax provisions in the California Building Code warn us to be wary of existing retrofits. Retrofit Professionals must Understand Many Fields. Retrofit contractors must understand metallurgy, the qualities of existing concrete, the performance of buildings on shake tables, existing building materials such as sheet rock, woven wire lath and Portland cement (stucco) earthquake engineering, building codes, hardware testing, The National Design Specification etc.